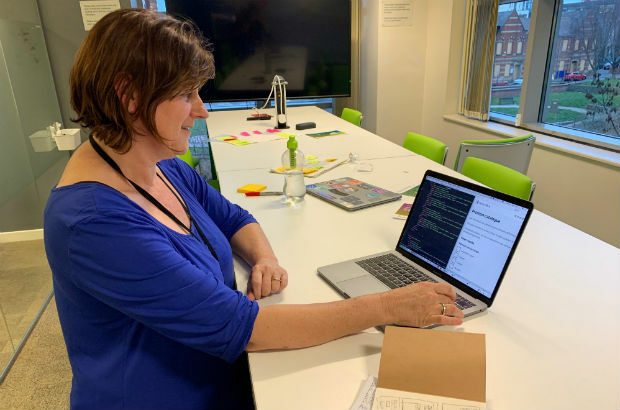 As an interaction design intern on the Home Office internship programme, I wanted to share my experience of changing careers to work in user-centred design in government. Joining the Home Office has been a series of happy coincidences. I had a job at a charity called National Aids Map in London that involved doing design work for their website and I was also a consultant designer at Amnesty International UK. As a graphic designer with more than 25 years’ experience in the charity sector, all my design work seemed to emanate from London but I was based in Sheffield. I felt I needed to progress my skills and wanted to understand what was involved in designing for end-to-end digital services. Although I was familiar with the role of user experience designer, I hadn’t previously heard of interaction design. In government, user experience is the responsibility of the team, not one role. This was a revelation for me as it’s rare in graphic design to be involved in user research, development and the implementation of a project or service from the initial stages. In my research for the role, I came across many insightful blog posts on GOV.UK, including Holly Ellis’ blog post on diversity and recruitment and the discrimination of ageing. After reading these posts, I felt encouraged to use my experience and maturity to change careers and apply for the internship position. I've been working with the Police Digital Service on a project based in Sheffield. The work was in the Discovery phase, which involved our team interviewing service users and stakeholders to identify user needs. After 3 months of intense research we had workshops and produced a report on our findings, before a decision was made on whether to progress to Alpha. I'm now working on a new project with the Police Digital Service using the Home Office prototyping kit to help design the service. Alongside this work, all of the interns are working together on charity projects. For example, I am involved with a team working with Turn2Us, who provide help and advice to people in financial crisis. Our team includes user researchers, an interaction designer (me) and a software engineer. The internship programme is a great opportunity and an investment in my future. There is plenty of support and training provided. I've taken a pay cut, but I've expanded my skills set enormously. I work close to my home in Sheffield, and I've maintained my connection to London as I take regular trips to meet my Home Office colleagues. I love the flexible working culture and this has improved my work-life balance. This internship has given me the chance to change my career and I am looking forward to taking this training and networking into the next phase of my working life.